In the ever-evolving pharmaceutical environment, portfolio strategy and management executives face numerous challenges in both long-term strategy and shorter-term operational portfolio management, as well as in alignment and effective blending of those two objectives. As the market continues to see heightened levels of saturation with competitive products and new drug indications are increasingly difficult to discover, portfolio executives seek insight into improved methods for moving products rapidly through the pipeline from the clinical stage to the commercial. Portfolio leaders strive to balance R&D and commercial perspectives on project prioritization and budgetary needs, and also seek clear insight into future market trends in order to accurately calculate risk, all while actively aligning portfolio strategy initiatives with overall company vision. 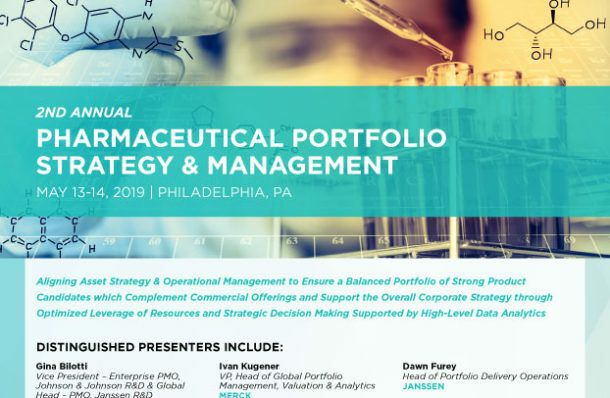 The 2nd Annual Pharmaceutical Portfolio Strategy & Management Conference will provide attendees the opportunity to examine both the strategy side of portfolio management and day-to-day operational portfolio management, as well as to discover new ways of effectively connecting the two disciplines. Industry-leading portfolio executives will share perspectives on risk measurement, data integrity and governance, and maximizing R&D budget for new discoveries while also maintaining adequate financial focus on existing commercialized products. To further enhance understanding of unique solutions to complex challenges, participants will also have the opportunity to engage in small group formats and share insight among peers, fostering a must-attend educational and networking event.